Linguistically It all started with the word cult (=service to God) and culture (=creation, preserving manhoods spiritual and material creation). Commonly In ancient civilizations - both were created with service to God and around the actual service, although as history progressed circumstances continued in a more emphasized way, occasionally in a closer interaction, then separating, eventually distancing from one another. In pascal singing in Vrbanj on the island of Hvar - throughout the whole island and along our coastline - a specific service to God and spiritual culture has developed since the Middle Ages. This is emphasized through the Christian pascal heritage, which is common in the Mediterranean circles, which throughout the whole of Europe tells us of the beauty of interaction. 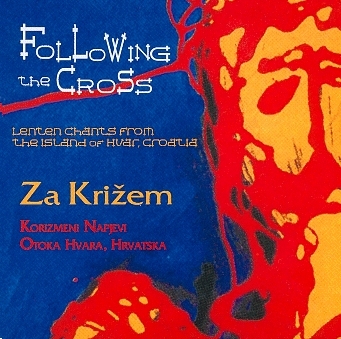 It was created from believers and material sacral signs and symbols, in a touching way in a vocal form celebrates liturgical texts in the Great week. 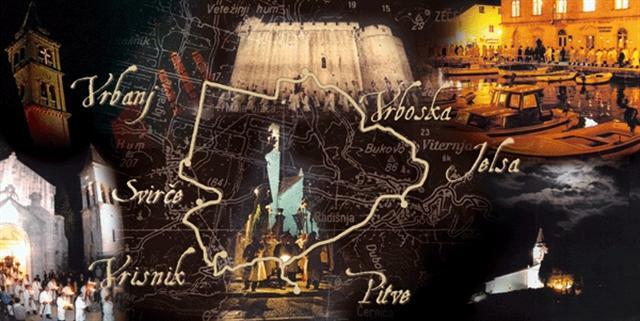 Near Hvar, Stari grad, Vrboska, Jelsa and Vrbanj, both the cult and culture are extended. Vrbanj itself is an agricultural area, while the other mentioned towns are more urban. Because of this we can conclude that the pascal singing in Vrbanj is more authentic. For centuries the local population has loved and admired such texture -because Catholics on Hvar have preserved and nurtured this pascal texture. Ethnologists and musicians have paid special attention to this spiritual singing, starting from the collectors of customs from the 19th century, A. I. Caric, musician B. Sokol between the two world wars, all up to the living musician Ljubo StipiĹĄic. Miki Bratanic not only nurtures Vrbanj's pascal heritage but also records it. M. Bratanic has decided to present just one source of pascal service in the final three days in the Great week in Vrbanj. This version is full length and contains melodies, which have not been released to date, which is why this version is so treasured. These melodies are no longer even sung in mass ceremonies. Due to the norms of the Second Vatican Council a large proportion of the texts have been changed and when this was combined with the heads of church choirs which did not appreciate the essence of pascal singing, then the true richness was lost. Even though not everything that is old is necessarily worth while, we can definitely say that when pascal heritage is in question that 'older the better' is the case (Luke 5, 39). 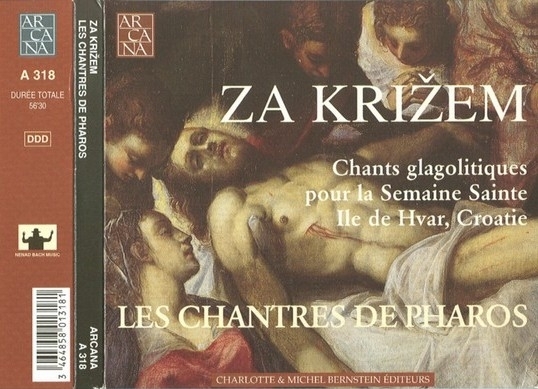 In M. Bratantc's records of 26 melodies, which are on this CD, the first collection of pascal melodies is from one Hvar parish. Vrbanj's parish priest and himself an excellent singer father Branimir Marinovic has always seen the need to maintain this form of cultural heritage. This CD not only contains the evangelical passages which during the Great week are celebrated in services, but truly contain great and Holy days within the Great week which were once part of services and today cannot be heard. In Bratanic's recordings we can hear the preserved liturgical voice, which the biblical translator Franciscan Petar VlaĹĄic would say is the feeling for the old1. He also knew how to create the relation between the voice of the cult and linguistic culture in our cultural circle. Most of all, we have an ethno-musical recording where we can see the interaction of the cult of service to God and a local culture. This CD truly enriches our vocabulary for pascal heritage, and gives me great pleasure that it has been compiled. A quick update, Don Branimir retired a few years ago, father Ivica Babic is now parish priest in Vrbanj. Regards and best wishes for Easter from South Africa.